Todds Plumbing and Heating Services Ltd is pleased to offer professional power flushing services to its residential and business customers. Radiators rust internally producing black iron oxide ‘sludge’. This sludge moves around the heating system blocking pipes, valves and boilers (pumps/heat exchangers/diverter valves), making it harder for heat to circulate to radiators. Circulation and flow problems are thus created. Traditional methods of flushing just don’t get rid of all the debris, and problems often quickly return. In cases described above, we would recommend a Power Flush. Power Flushing describes the process by which central heating heating systems are forcibly cleansed using water at high speed, but low pressure. No physical damage is caused to the system. The process can be made even more effective with the addition of powerful cleansing and mobilising agents. Our technique of power flushing in Hampshire can thus remove undesirable corrosion residues and replace so-called aggressive water quickly, restoring circulation and efficiency and preventing future problems. Power flush equipment is connected to your central heating and cleans the whole system without having to take off all the radiators. We can also use Power Flush to clean new central heating systems in order to remove excess flux and other debris, together with the grease and oil used to prevent the rusting of components before use. 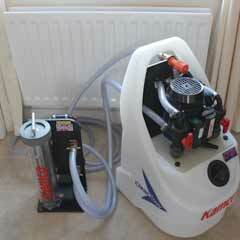 We are fully trained and experienced to carry out your Power Flushing in Hampshire. It is worth remembering that any untrained person carrying out a Power Flush can easily ruin your central heating system by, for example, using an incorrect solution to clean a boiler containing an aluminium heat exchanger. If you are worried about your boiler and heating system please do give us a call today to discuss your Power Flush requirements and for a free no obligation quote. We would be happy to help. Todds heating and plumbing limited are experienced and qualified gas safe registered engineers suitably qualified to conduct power flushing in Hampshire.